In this lesson, we will create another ring, but it will echo the cross shape as well. We have duplicated our image, merged the 16 layers of ring 1 and labeled this as phase 3. We now select a lavender blossom and create a ring of 12. When I am tansitioning from a ring of 8 to 12, I like to leave sufficient space between the rings so that the eye is not offended. Proceed as previously duplicating and rotating through the first 4 layers. Now, however, instead of rotatin 45°, we will rotate 30°. Duplicate those layers and rotate 30° again. Presto! We now have a ring of 12 flowers. Again, we have some big gaps. We could adjust scale and positioning to convert this to a ring of 24, but I want to try something different. Select anothe flower to fill in gaps and scale to a little smaller that our exixting blooms. Rotate so that it fits into ring. Duplicate and flip horizontlally. Duplicate and proceed as before to create the image you see here. 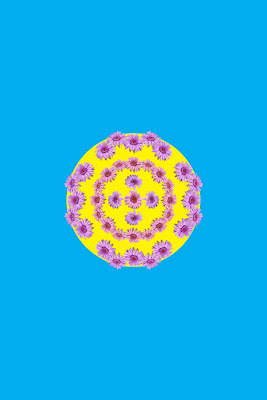 We could duplicate our first smaller flower, rotate it to fit and fill in the gaps to create an unbroken ring. I am choosing to leave the gaps and create an echo of our central cross. The mandala designs are about repitition and symmetry, but we need to add interest by breaking up the sameness and incorporating some elements of surprise. After you get through staring in amazement at what you have just done; duplicate image, save original, label duplicate as phase 4, merge layers of ring 2, and fasten your seat belts for lesson 19.